Max, an old gangster and his friend have made thei last big thing. They were able to get about 50 Mio Frances, and they think they can retiere now. But his fiends girl is rid of him, and has a new one, Angelo, who is the boss of an other gang. By her he get the information who has the money and he wants to get it. So he kidnapps Max partner. Max ask some of his friends to find his partner, but then he gets the Message, that he can exchange the money with his partner. Both sides are of the opinion, they are cleverer than the other side. And at the end, Angelo and his men are dead, the money is by the police and Max' friend is also dead. Wonderful gangster-story by Jacques Becke It would be nonsense to give an order of merit to the three cinematic masterpieces by director Jacques Becker. However, personally I love "Touchez pas au grisbi" even more than "Casque d'or" or "Le Trou". In "Touchez pas au grisbi" we find all we can ask from a Becker's film: splendid black-and-white cinematography,evocative, romantic atmosphere, brilliant script, stunning excellence of the actors' job. But here we get more: a tough, perfectly written gangster-story, swift pace and action blended with an outstanding psychological design. The movie is mainly a story of friendship and honor. We have two old pals, two aged gangsters close to retire: Max (Jean Gabin), smart and clever, well aware that their best years are over, and Riton (Rene Dary), naive and rash, unable to accept the end of their youth, even dumb if you want, but extremely brave and devoted to his friend. Max is constantly grumbling against Riton and the troubles he causes. He scorns Riton's courage... brains and good sense, that's the important thing... But when it's the time for action, we see how deep and touching their friendship is, how ready they are to sacrifice themselves for each other. In other words, there are circumstances when only courage and honor count... According to his usual style, Becker describes the world of criminals as a weird parallel of the world of "decent people". To be a gangster appears a job like another: a day at the office. See Max's poise and professional way, when he negotiates the value of the "grisbi" (the swag) with the receiver. And when Max is going to face a last-blood gang-war, he quietly leaves a large sum of money to a trusted bar-maid, in case of need "... to tip somebody (i.e. police or judges)... to fix possible problems... you know better..." Inside a story narrated in the most understated way, Becker inserts unexpected explosions of violence. Take the owner of the Night Club, another old pal of Max's and Riton's. Poised, always silent, short, fat, with thick glasses, he seems the less harmful person. Yet, suddenly, and without a single word of comment, he starts to brutally beat a thug from a rival gang. And, with the machine-gun, he shows himself even tougher than Max and Riton. Of course, the movie also offers a Gabin's trade-mark scene, when he slaps everybody, men and women as well. Great stuff: toughness mixed with sense of humour. Gabin's performance is at the highest level reached in a glorious career. What else to add? 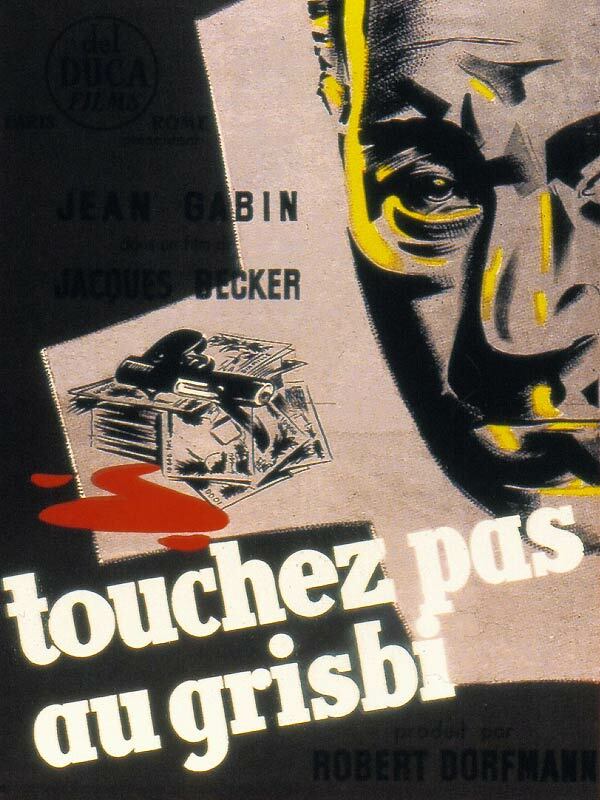 "Touchez pas au grisbi" is a fantastic masterpiece. Moreover, I guess that this film is good for all tastes , which probably can't be said for other Becker's cinematic gems.